What would you do if your colleagues continually shared offensive and stereotypical racial jokes? How would you respond if the same managers who continually made sexist comments also unfairly critiqued your work contributions, while you watched others being fast-tracked for promotions? Or if your co-workers questioned your legal status to work,your English skills, or your ability to do your job? While any one of these experiences alone might not cause an employee to leave a company, we wanted to learn more about how tech workplace culture and the cumulative experiences and microaggressions might affect employee turnover. And more specifically, we wanted to know whether tech workplace culture contributes to tech’s overall dismal diversity numbers by driving underrepresented employees out of the door. To date, there have been no representative studies of tech workplace cultures or what experiences drive employees out of the door. The Tech Leavers Study is a first-of-its-kind national study examining why people voluntarily left their jobs in tech. The Kapor Center and Harris Poll surveyed a representative sample of more than 2,000 U.S. adults who have left a job in a technology-related industry or function within the last three years. Workplace culture drives turnover, significantly affecting the retention of underrepresented groups, and costing the industry more than $16 billion each year. While employees across all backgrounds chose to leave their jobs for a variety of reasons, a significant number also cited workplace culture as a driving force behind their decision. Nearly 40% of employees surveyed indicated that unfairness or mistreatment played a major role in their decision to leave their company, and underrepresented men were most likely to leave due to unfairness. 1 in 10 women experienced unwanted sexual attention, while LGBT employees were most likely to be bullied and/or experience public humiliation. 78% of employees reported experiencing some form of unfair behavior or treatment; Women from all backgrounds experienced/observed significantly more unfairness than men and unfairness was more pronounced in tech companies than non-tech companies. Underrepresented men and women of color experienced stereotyping at twice the rate of White and Asian men and women; 30% of underrepresented women of color were passed over for promotion. Experiencing and observing unfairness was a significant predictor of leaving due to unfairness, and the more bullying experienced, the shorter the length of time that employees remained at their previous company. But there is also a silver lining in the data. Findings show that tech companies can take proactive steps to improve workplace culture and retain talent. Nearly two-thirds of tech leavers indicate that they would have stayed if their employer fixed its culture. Having a diversity and inclusion strategy was associated with fewer reports of unfairness, significantly lower sexual harassment, bullying and stereotyping, and lower rates of leaving due to unfairness. Having a comprehensive diversity and inclusion strategy in place had a much greater impact than having individual initiatives (e.g., unconscious bias training). Unfairness in the form of everyday behavior (stereotyping, harassment, microaggressions, etc.) is a very real and damaging part of the tech work environment, specifically affecting underrepresented groups, driving turnover, and affecting companies in financial and reputational costs. By focusing on improving workplace culture, we can work to remove the factors that cause valuable employees to leave, and improve the diversity and inclusion of tech workplaces for all employees. Women left their jobs to pursue better opportunities and to leave unfair environments, with differences existing by race. The top two reasons why women overall left tech occupations were: to seek a better opportunity (33%) and to leave unfair environments (32%). Unfairness, however, was the top reason for leaving for women of color (36%), while White/Asian women were less likely to leave for this reason (28%). Women reported a range of experiences from being passed over for promotions to stereotyping and harassment. Women of color often had different experiences than White and Asian women. Women had significantly more experiences with unfair treatment than men (p<.00). 1 in 10 women reported experiencing unwanted sexual attention; 55% of them said this experience influenced their decision to leave. Women reported having others’ take credit for their work (27%), being passed over for promotion (25%), and assumptions about their ability (16%), at rates higher than men (22%, 22%, and 13%). 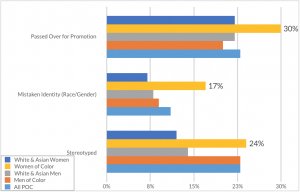 Women of color reported the highest rates of being passed over for promotion (30%), being stereotyped (24%), and having their identity mistaken for another person of the same race/gender (17%) of any group. Women’s negative experiences were directly related to turnover. 56% of women who experienced unwanted sexual attention said that these experiences contributed to their decision to leave their previous company. 59% of women of color who were passed over for promotion said this experience contributed to their decision to leave. Women want more (equal) pay and better leadership, but equally important are having work-life balance and a respectful environment to work in. The sample of women in the Tech Leavers Study included a total of 594 women, 67% were White or Asian and 33% were Black, Latinx, or Native American/Alaskan Native. See the Appendix for more detailed data on the sample. Underrepresented people of color left their jobs in tech due to unfairness at higher rates than their White and Asian colleagues. Men of color were more likely than any other group to leave their prior company due to unfairness (40%), slightly higher than White and Asian men (38%). Unfairness was much more likely to be a significant factor in the decision to leave for underrepresented women of color (36%) than White and Asian women (28%). Note: All questions were separate and independent questions and thus are not intended to sum to 100%. 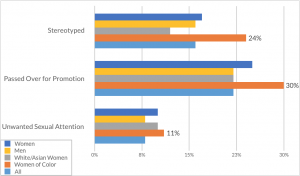 Underrepresented people of color in tech reported specific experiences with stereotyping. For women of color, there were additional barriers at the intersection of race and gender. Nearly 1 in 4 underrepresented people of color experienced being stereotyped in their former company (23%). Women of color experienced stereotyping 2x more often than White and Asian women. Women of color were most likely of any other group to be passed over for promotion (30%), significantly higher than both White and Asian women and men of color. Stereotyping was directly related to turnover for underrepresented people of color. For men and women of color, being stereotyped was the most significant driver of leaving due to unfairness, and 35% who experienced being stereotyped said it contributed to their decision to leave. Stereotyping was one of two categories of behaviors that was significantly related to length of employment; the more stereotyping experienced, the shorter the length of time employees remained at their previous company. Underrepresented people of color were seeking both better compensation and job promotions AND more meaningful, balanced work within a positive and inclusive environment. The sample of underrepresented people of color in the Tech Leavers Study included a total of 598 individuals, 68% were male and 32% female. See the Appendix for more detailed data on the sample. LGBTQ-identified employees left their tech jobs due to unfairness and dissatisfaction with the work environment. Unfairness/Mistreatment (37%) was the top reason for LGBTQ-identified tech employees to leave their companies. Dissatisfaction with Work Environment (30%) was the second most common factor driving turnover among LGBTQ-identified employees. LGBTQ-identified employees had many of the same experiences with unfair treatment as their peers, but the bullying and public humiliation among this group of employees dramatically stood out. 81% of LGBTQ employees experienced some form of unfairness in their previous workplace, and on average, they experienced roughly the same amount of experiences as their non-LGBTQ employees. However, LGBTQ employees had the highest rates of public humiliation and bullying of any group of employees. LGBTQ employees were much more likely to experience bullying (20%) and public humiliation (24%) than their non-LGBTQ colleagues (13% and 13%). Bullying and public humiliation were directly related to turnover for LGBTQ employees. For LGBTQ employees and women of all backgrounds, being bullied was the strongest predictor of leaving due to unfairness (p<.00), and 64% of LGBTQ employees who were bullied said the experience contributed to their decision to leave. 62% of LGBTQ employees who were publicly humiliated said it contributed to their decision to leave. Experiencing bullying/hostility was strongly related to length of employment; the more bullying experienced, the shorter the length of time that employees remained at their previous company. LGBTQ-identified employees were seeking both better compensation and job flexibility and a more respectful work environment. The sample of LGBTQ-identified employees in the Tech Leavers Study included a total of 142 individuals, 67% White or Asian and 32% Black, Latinx, or Native American/Alaskan Native. See the Appendix for more detailed data on the sample.